Like The Mall, Gillespie and I is a book that I won as part of a give-away, courtesy of Savidge Reads. I entered this one less for the premise of the book itself, which was okay; what sold me most, other than the lure of a free book, was the enthusiastic way in which he praised it. So, having finally read it, will it live up to the many good things that made me want it in the first place? Gillespie and I tells the story of Harriet Baxter, an English spinster who goes to Glasgow for the International Exhibition, following the death of the elderly aunt whom she was nursing. Whilst there, she becomes close friends with the Gillespie family; the father figure, Ned Gillespie, is an artist at the Exhibition, and it is his biography that an older Harriet purports this novel to be. At first glance, it appears to be an innocent enough narrative, maybe something along the lines of a slice of life/historical novel. That's when things start to go wrong; I shan't tell you exactly what goes wrong, but I will say that it comes about incredibly suddenly, tearing apart the family that come to feel very dear to you, as well as making you doubt everything that you had read before. In regards to plot, it is superbly written. Jane Harris sows seeds of doubt so expertly that you don't even realise they're there until something else comes up that makes you re-examine what you thought you knew. The ending of the novel left me rather shaken really, simply through the doubts that had built up over the course of it; if someone had asked me what my opinion of events was at the beginning, middle and end, I would have given completely different versions at each point, simply because the circumstances changed so much. I honestly can't find fault in this writing. 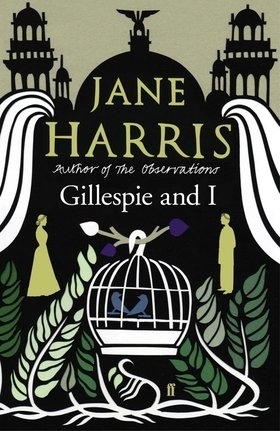 Probably the most important character in Gillespie and I is that of the narrator, Harriet. She's the most important character, yet I can't actually think of how to describe her. I can think of qualities that, had I been asked towards the beginning, would have come to mind: straightforward, helpful, loyal, intelligent and possessing a barbed wit. As of now, I can agree wholeheartedly about the last item I mentioned there: she does indeed have a barbed wit, which she uses to pepper the narrative with humorous asides. As for the other qualities, I honestly couldn't say one way or the other. The other main characters worth mentioning are the Gillespie family. There's Ned, an artist who is almost pre-disposed to seeing the best in other people and is devoted to his family, his children especially. His wife, Annie, is a little less trusting than Ned, but is a loyal friend when her trust has been earned. His mother, Elspeth, is largely self-absorbed, but undoubtedly has her family's best interests at heart. Finally, there are his children, Sibyl and Rose, who couldn't be more different in temperament. Almost every character grows on you by the end, which is why what happens feels so tragic and confusing.